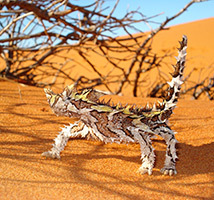 A spectacular blend of outback wild tracks, rolling red sand dunes, dense Acacia shrub-lands, magnificent bluffs, dramatic deserted beaches and wildlife. Head off under silent sail with the wind in your hair, the sun on your skin, a dash of salt spray, a smile on your face and oceans of wildlife. 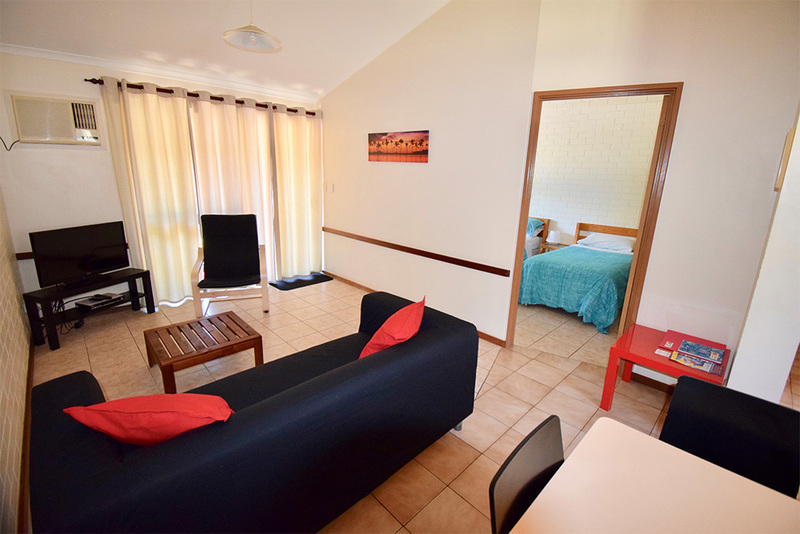 50m to the beach, private, spacious, spotless, central, cheery, self contained, self-catering & only 15 minutes drive from Monkey Mia. Sail with a bunch of animals - Love it, or it's free! The best way to see this magnificent variety is on a superb cruise with Australia's only purist wildlife sailing specialist, ‘Wildsights Cruises’ aboard Monkey Mia’s nature boat, the internationally famous, awesome, 60’(18m) sailing catamaran, Shotover (yes there’s a toilet on board). You can laze about and relax, or join in the fun of helping sail one of Australia's ocean racing legends. Lounge on a bean bag under the back deck shade awning. Soak up the sun on the huge trampoline nets. Chat with the crew, they know their stuff, including how to identify the dolphins for you. You'll learn how dolphins know who's around without seeing them, how they hunt with sound and live with sharks. Your skippers have been here more than 25 years, with our licence to enter the world's most important, dolphin and tiger shark behavioural research site and the first Dugong Interaction Licence in Western Australia with restricted access to the Dugong Management Zone at Monkey Mia, you’ll be taken to the best spots to get great shots. Thanks to our association with the scientists you'll discover the relationships between the animals and their environment, the reason for the behaviour you're seeing, the facts behind myths, some wacky secrets. Since we first commenced operation we’ve had the world’s leading dolphin and dugong behavioural scientists as advisors to ensure interactions are done in the best manner for the animals. 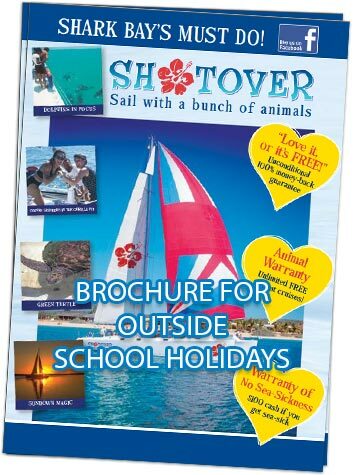 This resulted in Shotover’s cruises being the only cruises in the world scientifically proven to not have an effect on the dolphins. 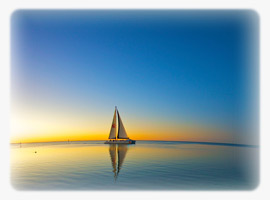 Take this opportunity to lie back and relax or join in the fun of helping sail the boat. Experience the exhilaration of freedom under silent sail. Head off with the wind in your hair, the sun on your skin, a dash of salt spray, a smile on your face and oceans of wildlife. 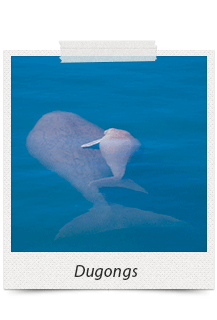 You have a choice of fabulous cruises, including the world's first daily, scheduled ‘mermaid' (dugong) watching cruise and Australia’s Last Sunset Cruise. 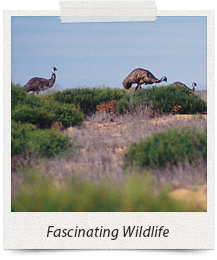 You’ll be awed by this spectacular, deserted piece of paradise, where Nature overwhelms. 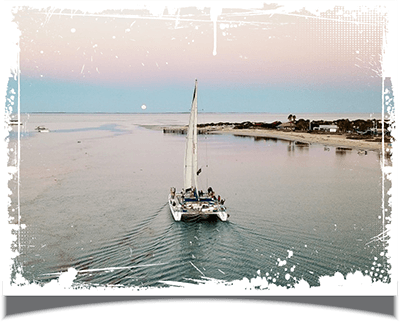 We are Australia's first marine wildlife cruises to hold Advanced Ecotourism Accreditation and the first business in the region to become an Accredited Tourism Business. 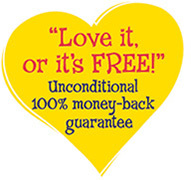 Your totally unconditional, 100% money-back guarantee to you. 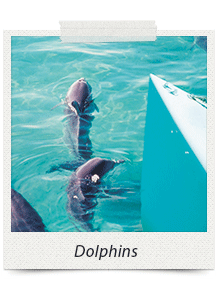 Imagine, a wildlife, sailing and fun experience that is so exceptional. 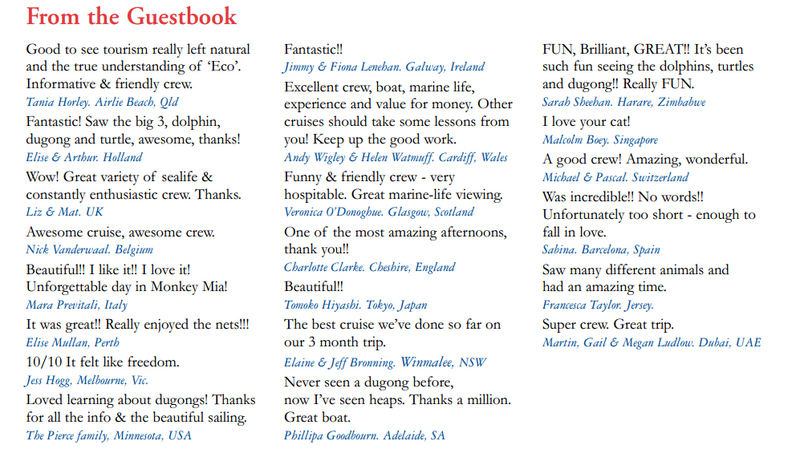 This extends beyond the cruise to also include everything available on board - clothing; printed items; food and drink. With wild animals there is naturally the possibility of occasionally not finding them, so we’ll remove that risk for you! 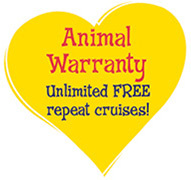 If ever you don’t see the animals to your satisfaction you are welcome to come back again, on any cruise, as our guest (yes, for free), as often as you like until you have seen the animals to your total satisfaction. Mind you we’ve been here since 1993, so we know where to go, and you've got excellent prospects of seeing animals. The only 100% certain seasickness cure is to sit under a gum tree. 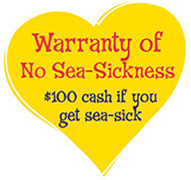 But thanks to Shotover’s exceptionally sea-kindly design seasickness is so unlikely, that we'll give $100 in soft warm cash to any fare paying passenger who gets physically seasick (no fingers in the throat!). 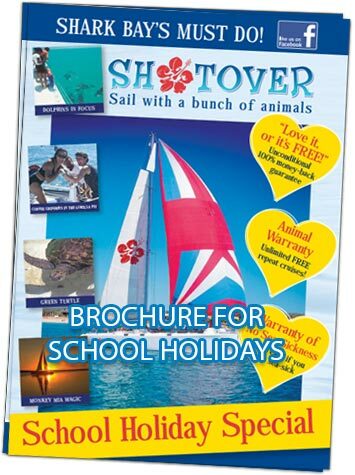 The two different brochures show the cruise schedule changes during school holiday periods. To ensure you refer to the correct brochure check the school holiday dates in the calendar below. Click above to check seasonal calendar. School holidays are shown in orange. So you don’t miss a thing, you’ll be given the use of sunglasses fitted with specially treated, tinted lenses that eliminate surface glare to give you the best view of the animals underwater. The animals are outside. To see them, you need to be out there with them. There’s ringside seating around the boat and no cabin to obstruct your view of the animals. You’re always in fresh air and in touch with your friends and your crew. Weatherproof clothing and cosy blankets are provided. The sails and a rear deck awning provide shade. There’s a refreshing seawater shower if you really want to cool off. Plus free sunscreen. Shotover is primarily wind and solar powered and has virtually eliminated noise, air and water pollution, so your enjoyment isn’t affecting the animals or the planet. Through space-age technology, the fridge is actually cooled by the sun! The chemical-free toilet uses seawater and solar electricity to render toilet-waste bacteria-free. Our safe, Australian-made, cleaning products are made from sustainable, natural ingredients, which are phosphate and nitrate free and not tested on animals. We conserve fossil fuel by using extremely efficient, high-tech propellers coupled with low horsepower engines. Fossil fuel is further conserved by technologically extending our oil changes to yearly. Storing electricity in gel batteries eliminates the gassing and disposal problems of lead/acid batteries. A testimonial that sums up everything! I'm lucky enough to have been on the shotover wildsights cruise and sunset cruise a few times now and I can honestly say that it never disappoints! The wildsights cruise delivers on its promise of exciting encounters with wildlife in their natural setting and the sunset cruise is a great way to wind down at the end of the day with some good tunes and great company! To top it all off the friendly crew really know all there is to know about Shark Bay and its amazing creatures and are always up for a chat! Wouldn't recommend anyone else!!! Oceans of enjoyment - wildlife, sailing & fun. 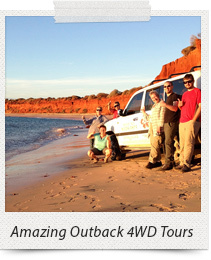 A fair dinkum off-road tour in a luxury 4WD, where the outback meets the coast with a knock out contrast. 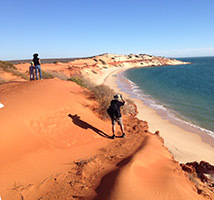 Be wowed by the spectacular Francois Peron Peninsula National Park in the unique Shark Bay World Heritage Area. Only great photos are possible. Guaranteed. Highly personalised, limited to 6 guests. 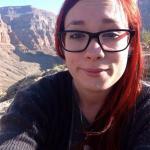 As well as being informative, the tour is casual and relaxed, with an emphasis on fun. Get the whole picture. See the land and sea, from the sea and land. 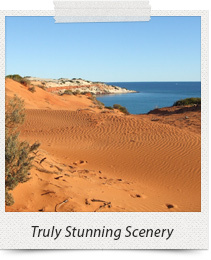 Explore both the Francois Peron National Park and the Shark Bay Marine Park with our talented gang. Save heaps and remember... You’ll love it, or it’s free! 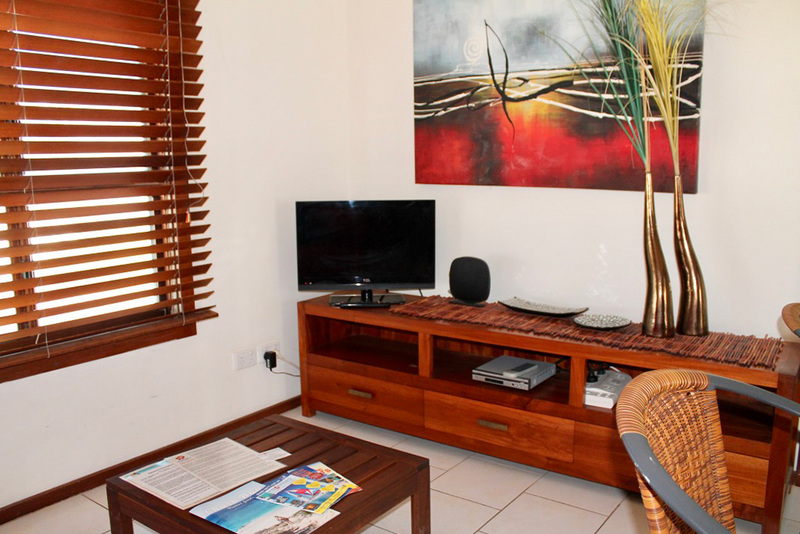 Surrounded by palm trees and gardens the Villas are situated in Durlacher Street, just 30 metres from the waterfront of Knight Terrace, the main street in central Denham. 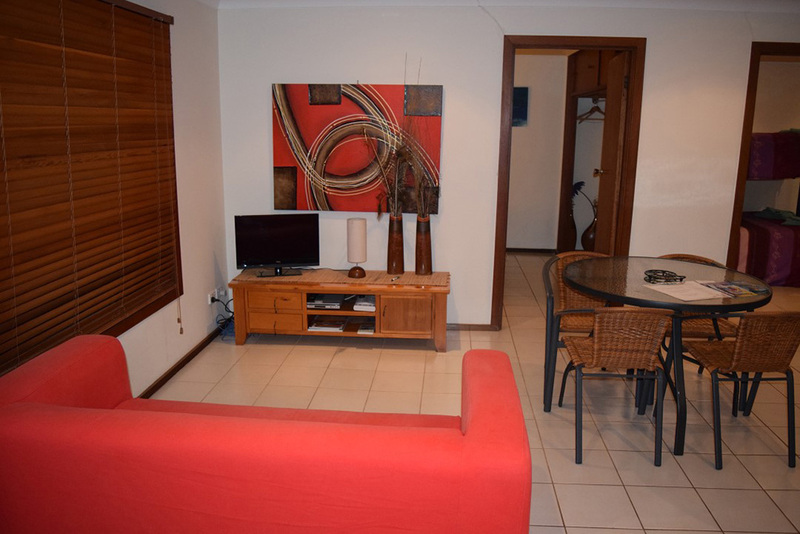 They are the most centrally located, self-catering accommodation in Denham. Every facility is within a 300 metre short stroll along the waterfront . Yes, you really can walk to all the shops, bars and restaurants. Breathe the fresh sea air and enjoy a sundowner with your front row seat of glorious sunsets. 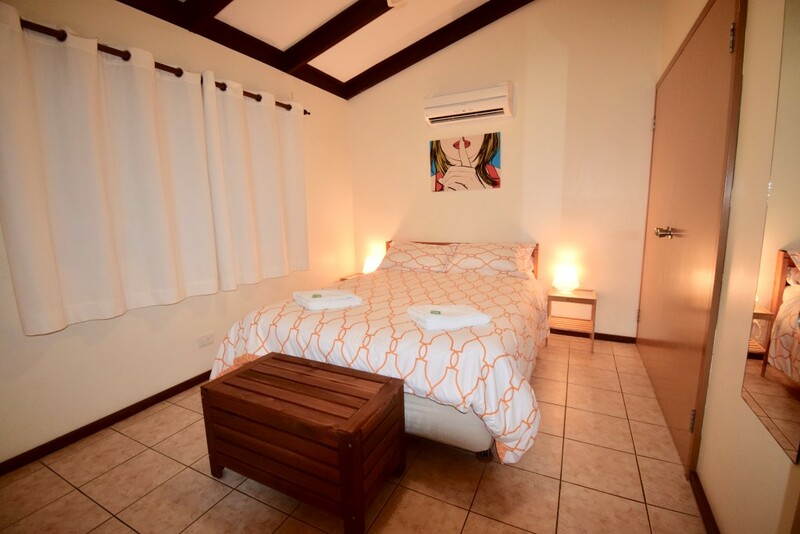 Monkey Mia is just a 15 minute drive. 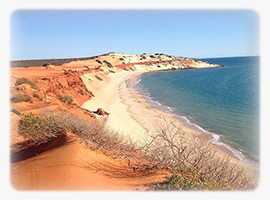 The Shark Bay airport is a 5 minute drive and yes we'll pick you up/drop you off. A lot of practical thought has gone into making your Villa a welcoming home away from home. 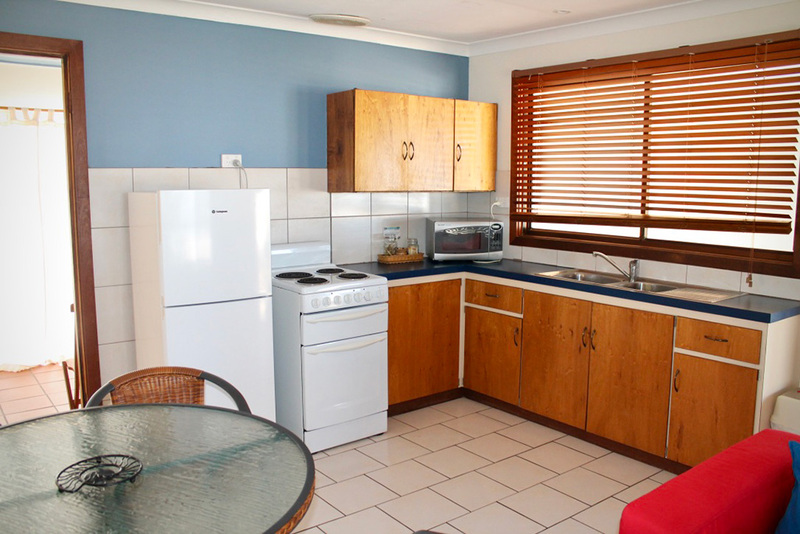 Fully equipped to be self-sufficient and comfortable with easy living tiled floors throughout. 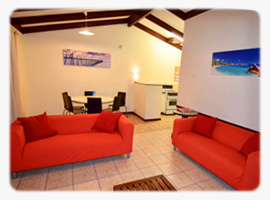 Each Villa is bright, spacious and cheery. 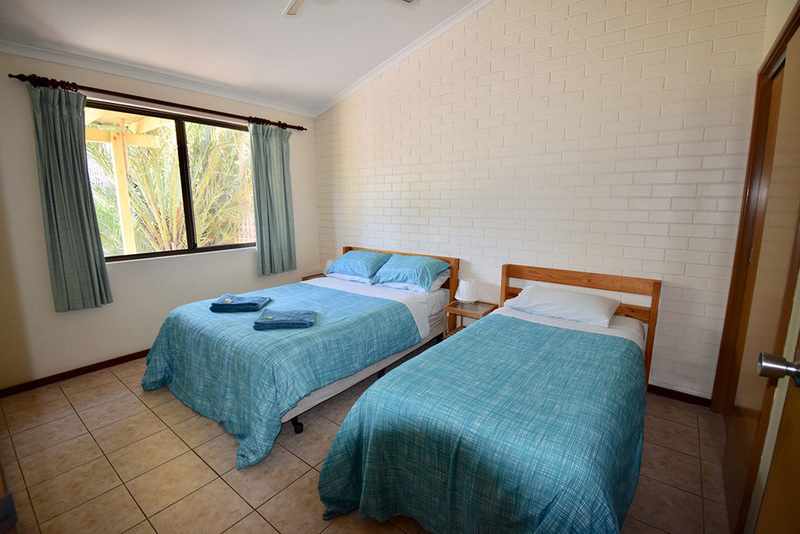 Your own fully equipped laundry with 5kg washing machine, laundry tub, iron and ironing board and your own clothes drying court. 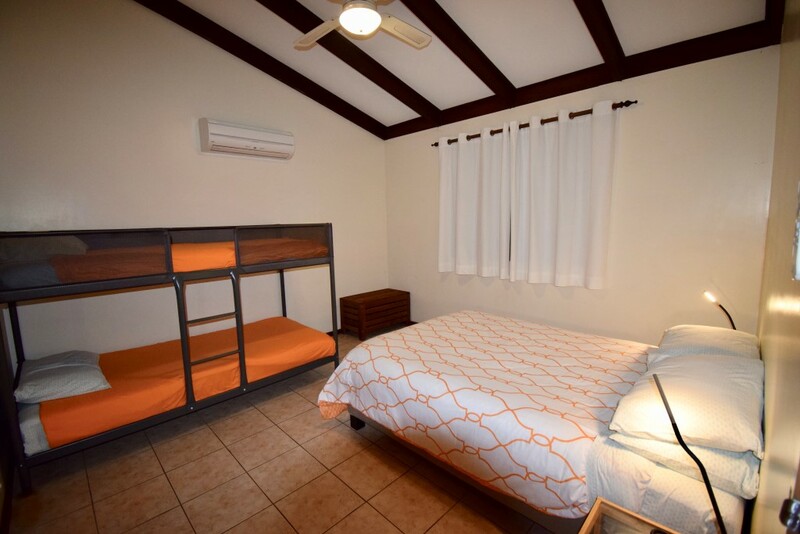 The combined bathroom contains a screened shower recess, vanity and toilet..
Each Villa is Complete with full insect screening, air-conditioning, ceiling fans and has its own covered patio with a stylish outdoor setting of table and chairs. 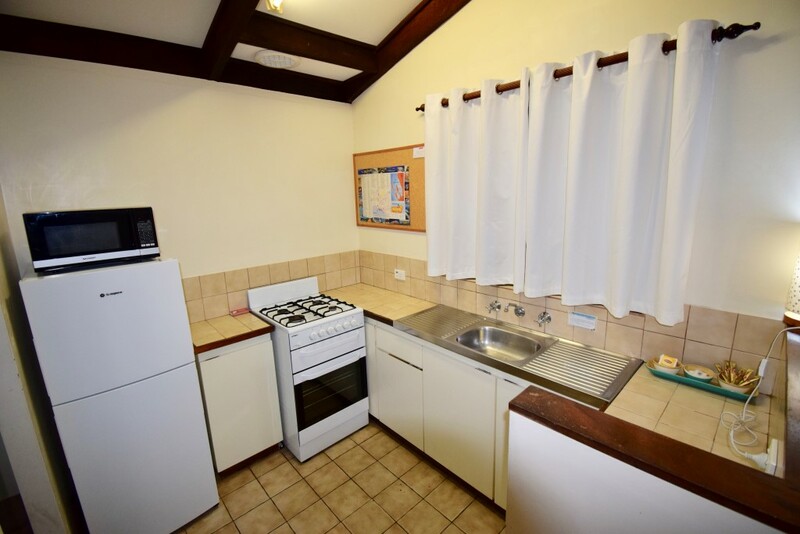 The built-in kitchen includes a full size, 4 burner gas stove with grill and oven; a 240 litre fridge/freezer; microwave oven, crockery, cutlery, pots, pans, toaster and electric kettle. A digital, flat screen TV gives you nationwide access to over 40 channels. Your linen is laundered with an Australian Nature product to pamper skins sensitive to conventional detergents. The linen is then dried in brilliant sunshine and the wholesome sea breeze straight off the Indian Ocean. We're not claiming ultimate luxury, just that you'll appreciate the clean, stylish, casual comfort and real value. It's what we hope to find when we travel. If you've got a junior traveller with you, let us know upon booking if you need a stroller or cot. A one-off $20 fee gives you access to all or any one, for the length of your stay. Free on site car parking with limited on-site parking for trailers. If you have a large boat/trailer/caravan alternative parking will be provided 300 metres away at one of our sister properties which has ample parking with very easy access. Just let us know at time of booking what your extra parking needs are and we'll take it from there. 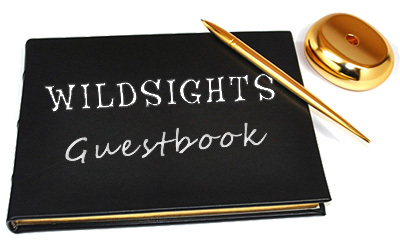 Guests are entitled to 10% discount on sailing cruises operated by Wildsights Cruises but only by booking direct with Wildsights on 99 481 481. 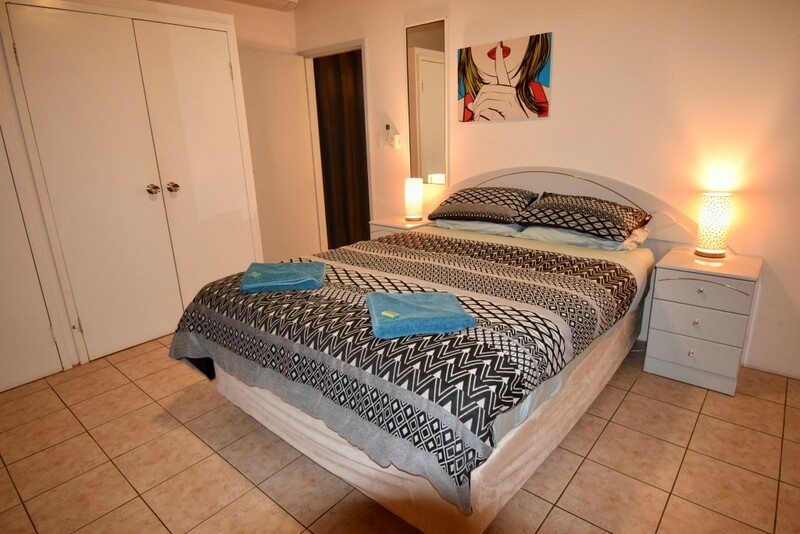 Beds: 1 double, 1 single together in one bedroom. 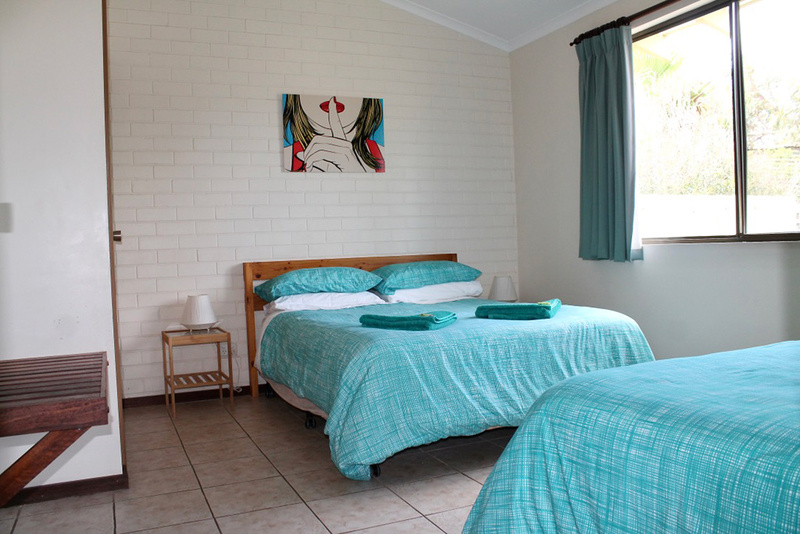 Beds: 1 queen, 1 double and 1 bunk bed sleeps 6 or 1 queen, 2 single beds and 1 bunk bed. Formerly the owner's Villa, a lot of practical thought has gone into making your Villa a welcoming home away from home. Fully equipped to be self-sufficient and comfortable with insect screens. 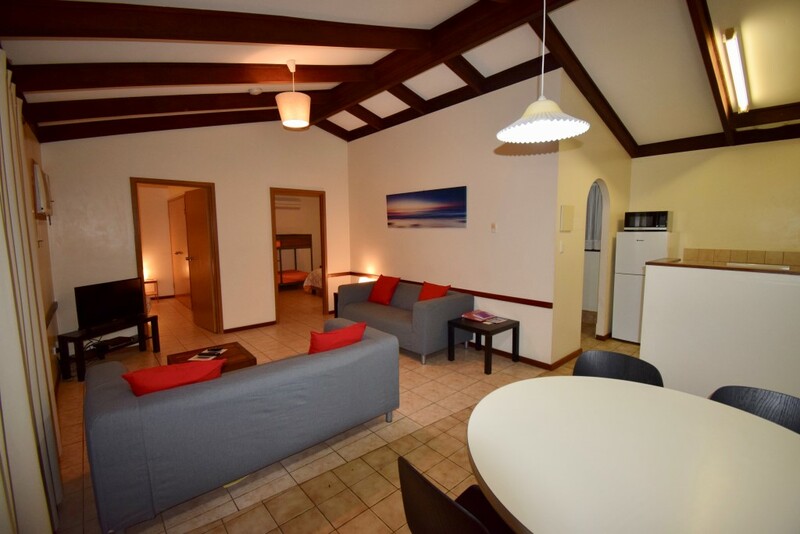 The Villa is bright, spacious and cheery. A large Villa with an open plan lounge/dining area/kitchen that complements a feeling of spaciousness. 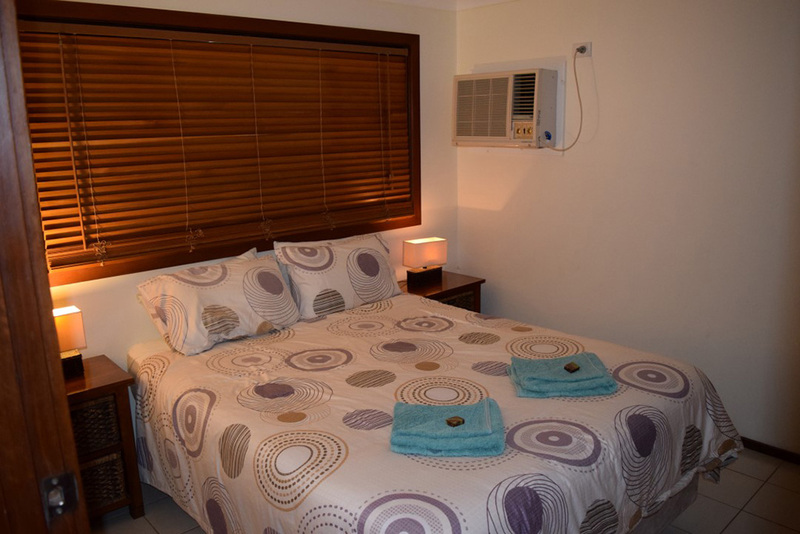 Two roomy separate upstairs bedroom/s with built-in wardrobes and air conditioning. Villa Size: 80 sq.m (900 ft²) Both bedrooms are upstairs, accessible by stairs only. 2nd bedroom: 1 double and a single bed. There is a $20 extra charge per extra person for more than 2 people. Western Australia school holiday periods increase rates by 20%. 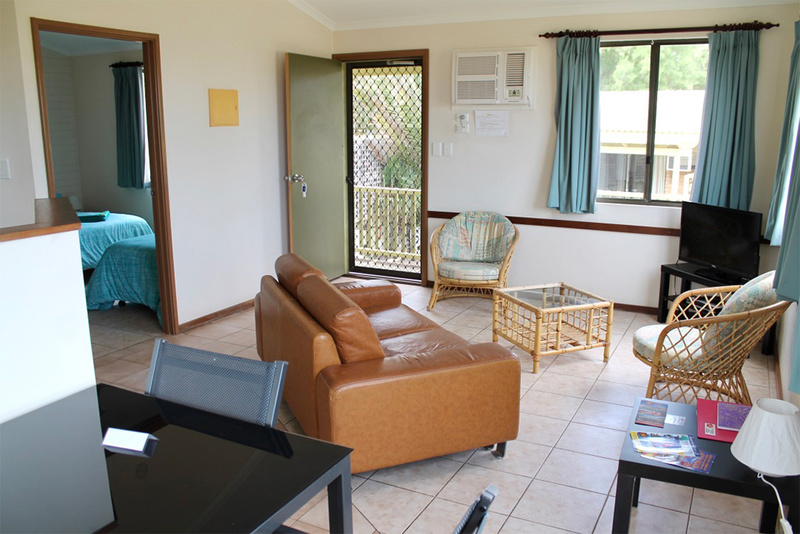 You can contact us on 1800 241 481 to make your reservation. 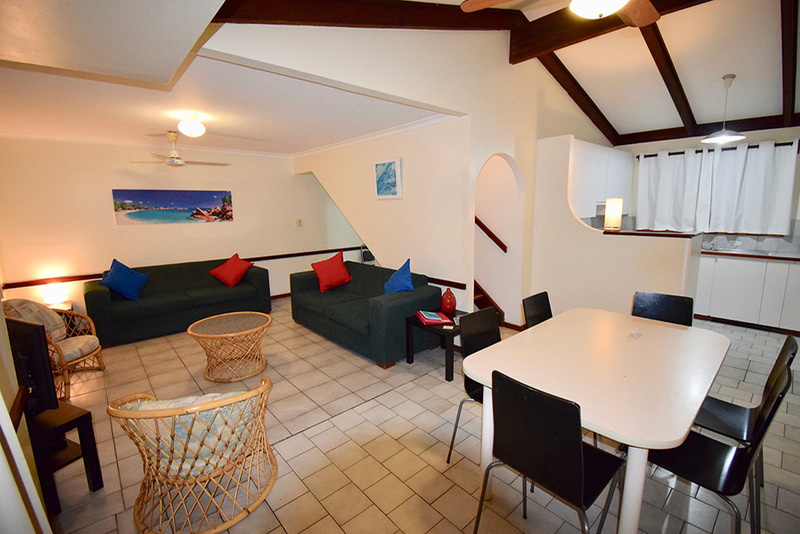 These two adjacent, private, absolute beachfront units are bright, spacious and cheery. They are fully self contained. Only 15 minutes drive from Monkey Mia. 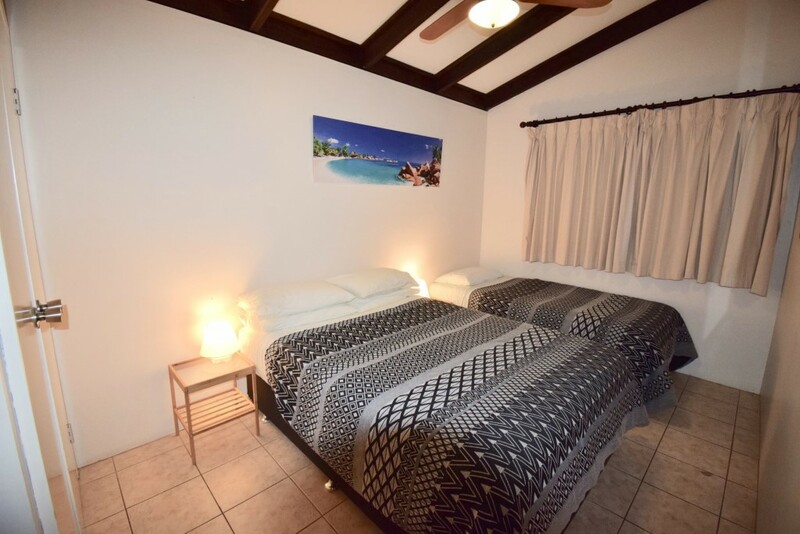 Located in Denham town centre with the Supermarket across the street and everything else within a short stroll along the waterfront. Yes, you really can walk to all the shops, bars and restaurants. Bring your boat, there's a ton of parking space. The building is called the Beach House because that's what it is! It's unpretentious on the outside and very cosy on the inside. We've put a lot of practical thought into making this your welcoming home away from home. Wake up to breathtaking bay views. Walk across the street for a swim. 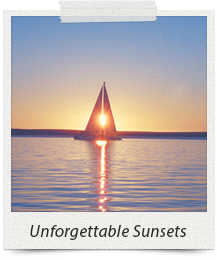 Breath the fresh sea air and enjoy a sundowner with your front row seat of glorious sunsets. 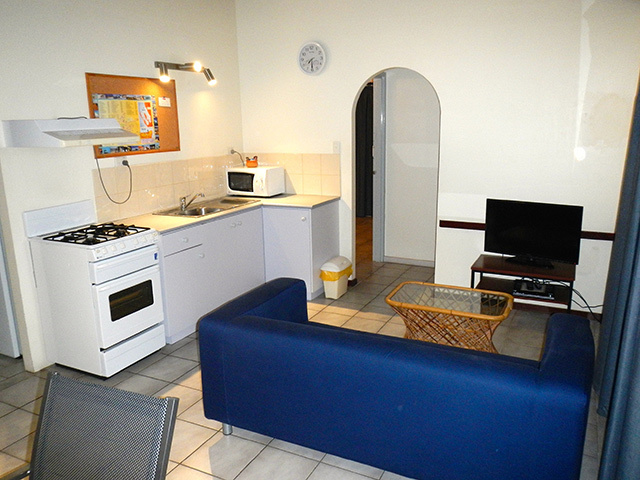 The units consist of a open plan lounge/dining/kitchen. 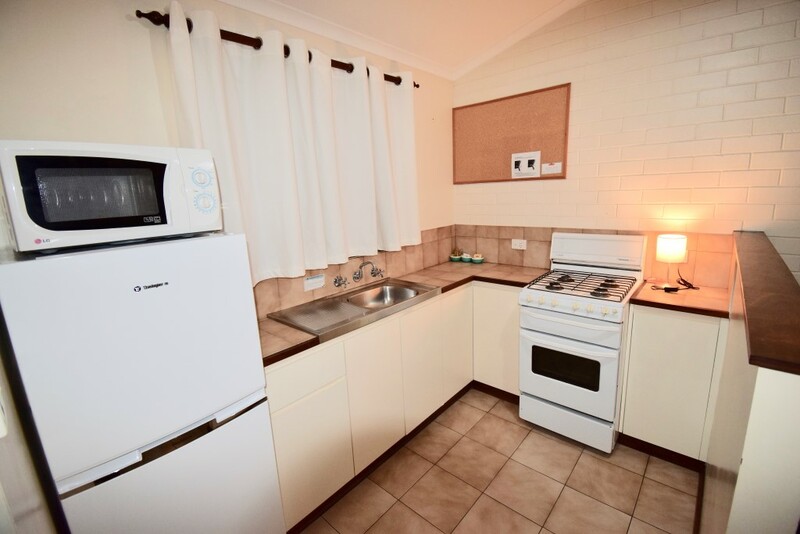 Separate bedroom/s. Sun room. Combined bathroom/laundry. Private toilet. Unit B also has a sheltered front patio facing west for the sunset. The queen size beds are high quality, with luxurious, crisp 500 thread Egyptian Cotton linen. Laundered with an Australian Nature product to pamper skins sensitive to conventional detergents. The linen is then dried in brilliant sunshine and the wholesome sea breeze straight off the Indian Ocean. We're not claiming luxury, just that you'll appreciate the clean, stylish, casual comfort and real value. It's what we hope to find when we travel. One bedroom with a queen bed. The sun room, or else the main bedroom, can accommodate a trundle bed (available on request). One with a queen bed and the other, a double bed with single bunk over. The sun room, or else the bedroom, can accommodate a trundle bed (available on request).